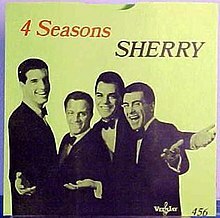 (1962) "Big Girls Don't Cry"
"Sherry" is a song written by Bob Gaudio and recorded by The Four Seasons. According to Gaudio, the song took about 15 minutes to write and was originally titled "Jackie Baby" (in honor of then-First Lady Jacqueline Kennedy). In a 1968 interview, Gaudio said that the song was inspired by the 1961 Bruce Channel hit "Hey! Baby". At the studio, the name was changed to "Terri Baby", and eventually to "Sherry", the name of the daughter of Gaudio's best friend, New York DJ Jack Spector. One of the names that Gaudio pondered for the song was "Peri Baby," which was the name of the record label for which Bob Crewe worked, named after the label owner's daughter. The single's B-side was "I've Cried Before". Both tracks were included in the group's subsequent album release, Golden Hits of the 4 Seasons (1963). It was the band's first nationally released single and their first number one hit, reaching the top of the U.S. Billboard Hot 100 on September 15, 1962. It remained at number one for five consecutive weeks, and number one on the R&B charts for one week. The song appears on the soundtrack of the 2011 film The Help. A version of the song was later recorded and released by British singer/songwriter Adrian Baker. It was released in July 1975 along with "I Was Only Fooling" on the Magnet Records label (MAG 34). A cover by Robert John entered Billboard's Hot Top 100 chart at position #82 on October 25, 1980; it spent 5 weeks on the Top 100, peaking at #70 on November 2, 1980. Another version was recorded by British pop group Dreamhouse, which appears on their debut album, released in 1998. ^ CHUM HIT PARADE: Week of September 17, 1962 at the Wayback Machine (archived November 7, 2006). CHUM Chart. ^ "The Help (Music From the Motion Picture)". Amazon.com. July 26, 2011. Retrieved January 30, 2012. ^ "Music: Top 100 Songs | Billboard Hot 100 Chart". Billboard.com. 1980-10-25. Retrieved 2016-09-26. ^ "Music: Top 100 Songs | Billboard Hot 100 Chart". Billboard.com. 1980-11-08. Retrieved 2016-09-26. This page was last edited on 18 February 2019, at 12:10 (UTC).